“Arts Night Out” welcomes a record number of talented artists to create colorful masterpieces in chalk on the sidewalks of 13 (or more!) downtown sites during the eighth annual Northampton Chalk Art Festival on Friday, September 8. The competitive event kicks off a festive weekend that includes the Northampton Arts Council’s RETROFAIRE on Saturday, September 9. Drawing takes place from 10 am until 4 pm on Friday. 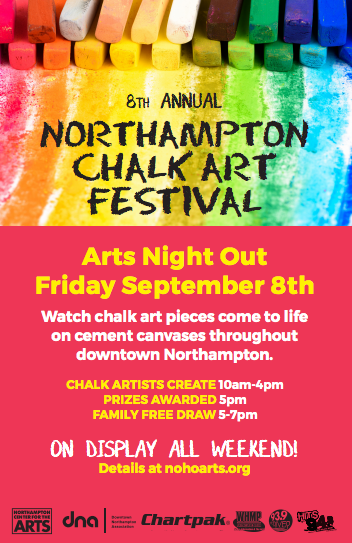 The public is encouraged to watch chalk art pieces develop and to view completed work in the evening while enjoying Northampton’s monthly gallery walk 5-8 pm. Cash prizes of $300, $200, and $100 will be awarded by a panel of judges for the top three creations. Presentations are made by the Mayor on the steps of City Hall at 5 pm. Individual chalk artists for 2017 feature former prize winners and seasoned competitors Linda Babcock, Jennifer Gutterman, Robert Markey, Chrissy Neithercott, and Sloan Tomlinson. They are joined by round-two veterans Erin Cleary, Jim DuBois, Rob Kimmel, and Sanket Sabnis. Team Bodalimadriguez, aka Stephanie Gerolimatos, Mark Bodah and Matt Rodriguez make a record-breaking 8th appearance! New to the event are artists Lauren Anderson, Corinne Cacioppo, and Nicole Singer. Chalk art sites are situated along the customary Arts Night Out route so that viewers also have an opportunity to stop at participating galleries and other venues. Festival locations include the Smith College Museum of Art, Forbes Library, Pulaski Park, Pinch, the Artisan Gallery, Cathy Cross, First Churches, Florence Bank, Don Muller Gallery, the Chamber of Commerce, and Click Workspace. Look for a piece near the deck entrance to the Northampton Brewery. Not to be missed is special guest and professional chalk artist David Zinn who will be demonstrating his amazing skills at Thornes Marketplace. Maps of the chalk art locations, along with their assigned artists, will be available at www.nohoarts.org, and printed copies will be distributed by a variety of Arts Night Out venues. 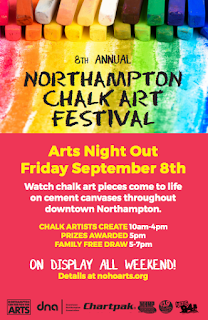 The Northampton Chalk Art Festival is sponsored by Chartpak, Inc., the Downtown Northampton Association, and the Northampton Radio Group. It is produced in cooperation with the City of Northampton and the Northampton Center for the Arts.